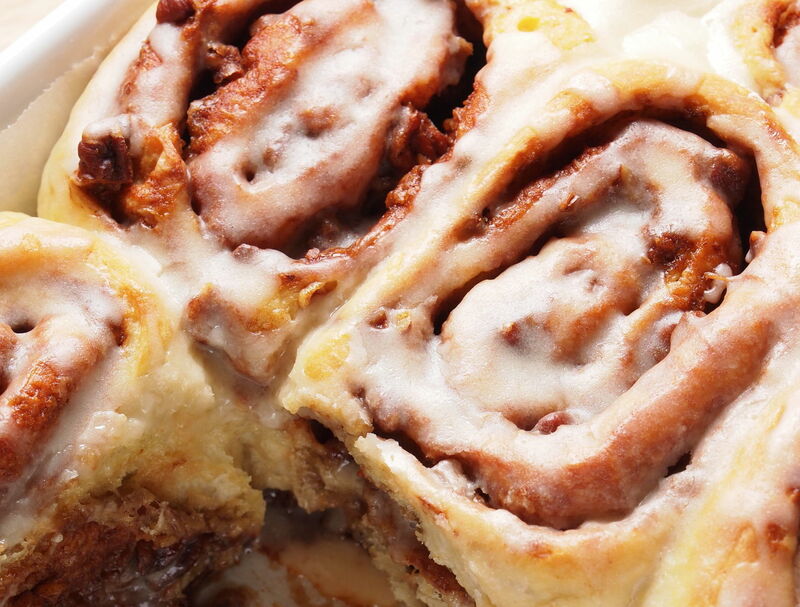 Any day that starts with cinnamon rolls is bound to be a great day, but these maple cinnamon rolls make the beginning of our day truly exceptional. You wouldn’t think the addition of maple syrup to the filling and icing of the rolls would make such a big difference, but it does! It adds a rich depth of flavor that you didn’t realize was lacking, and we might not ever go back to the original. Seriously, these are perfect year-round, but when it starts to get colder and the leaves start to change…these really can’t be beat! Pour warm milk into a bowl (or just use the bowl of your stand mixer, if using) and stir in sugar until dissolved. Stir yeast into the milk, then let sit 5-10 minutes, or until frothy. Note: if mixture doesn’t froth, discard and start over. Using the dough hook attachment, mix in butter and eggs, then add 4 cups flour. Beat until a rough dough begins to come together, then, mix in remaining 2/3 cup flour. Beat on medium speed for 5-7 minutes, or until dough is smooth and elastic. Turn dough out onto a clean surface and knead for 1-2 minutes, then transfer to a lightly greased bowl. Cover dough with a clean towel and place in a warm, draft-free place to rise. 1-2 hours. In a large bowl or mixer, start your filling by creaming together butter and brown sugar until combined and fluffy, then mix in maple syrup. Spread maple mixture over your dough, then evenly sprinkle cinnamon over the top. Starting with the long edge that’s farthest away from you, roll dough towards yourself to form a tight log. Use a sharp knife to cut 1 1/2-inch rounds, then transfer cinnamon rolls (cut side up) to a lightly greased baking dish. Place in a warm, draft-free place and let rise again for another 1-2 hours. Place risen rolls in the oven and bake for 20-25 minutes, or until tops are golden brown. Remove from oven and set aside.. In a medium bowl, whisk powdered sugar, maple syrup, milk and vanilla extract together until smooth. Note: add more sugar for a thicker glaze and more milk for a thinner glaze. 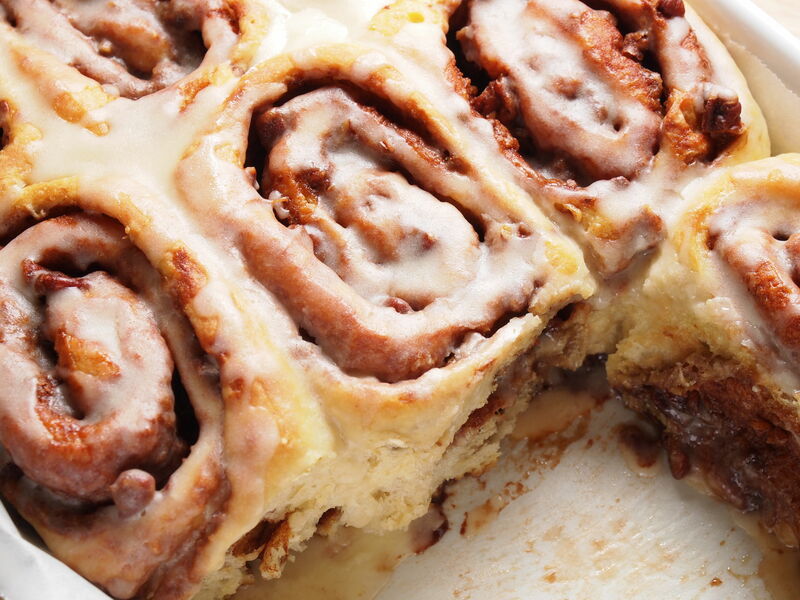 Drizzle glaze generously over cinnamon rolls and let cool…or enjoy immediately!